In recognition of the approach adopted by ASC Healthcare that influences and underpins all staff practice and aims to embrace the most up to date research surrounding the heterogeneity of learning disability and/or asc and its multiplicity of underlying causes we believe it impossible to create a living environment that will suit every single patient who accesses our service. Following on from our day to day approach and the impact of low self-esteem on a person’s well-being, we believe strongly that living and learning environments where a person feels safe, has sufficient proximal space, a level of freedom, is comfortable and is able to eliminate areas of sensory sensitivity all have an essential part to play in a person’s recovery and well-being, ultimately impacting on their length of stay. The ‘feel good factor’ experienced by patients is not considered to be especially unique to learning disability and/or asc but will also have an impact on staff in their daily delivery of care, therapy and support, their morale and motivation again affected by their level of esteem driven by working within a quality fit for purpose environment. Moving away from the traditional models of hospital service has always been our overarching aim, most of us will be well familiar with those services that continue to be described as specialist or specific with their long corridors giving access to bedrooms, having low ceilings, poor lighting and ventilation and their shiny easy to clean surfaces which are often noisy and unfriendly. ‘Proxemics’ (the space we need around us to feel comfortable) which tends to be more in the case of people with asc. Research also shows that people with a learning disability and/or asc living too close together can become anxious as a consequence of each other’s level of interaction or behavioural presentation whether direct or indirect and equally too much space can for some lead to other longer term difficulties in the sense that if you over-provide space you over compensate and over-protect to a point where there is unrealistic exposure to a real life experience. 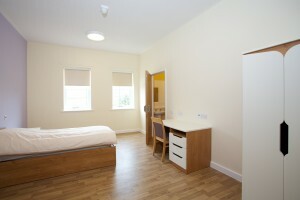 Our key priorities within this area have been to provide oversize rooms including bedrooms and en-suite facilities with higher than average ceilings giving a definitive sense and feeling of space. We have made good use of circulation spaces to avoided use of any corridors. The physical layout / geography also considers the removal of those features considered as stimulatory, particularly in relation to hyper and hypo- sensitive sensory integration difficulties experienced by some people with an asc. This has included due consideration being given within every room to acoustics, lighting, heating, ventilation, colour schemes, furnishings. Outdoor spaces are an essential part of any individual’s environmental awareness. We consider these outdoor spaces to be a great asset and will continuously develop them to ensure they prove to be secure, safe and least restrictive and promote a sense of independence. 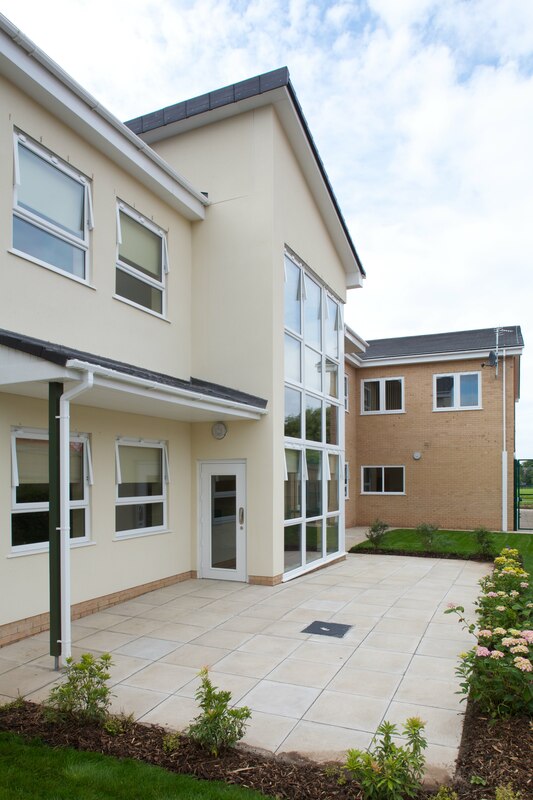 The living environments based within four apartments each having a shared lounge and separate dining facility are supported by an on-site therapy and activity suite including multi-faith room, a range of therapy / activity rooms, ADL kitchen and multifunction facilities. Environmental design and layout that allows the service to provide for both males and females, within gender specific environments (apartments) and are able to maximise each individual’s privacy and dignity.